OIOUBL ApplicationResponse is a document for the exchange of electronic receipts for processing electronic OIOUBL documents. The document is used for business receipts as well as technical receipts. ApplicationResponse is exchanged between SenderParty and ReceiverParty. See also [G23] for a more detailed description of parties. Applicationresponse is structured to meet the formal demands to a valid receipt for processing an electronical OIOUBL document. Applicationresponse must contain EndPointID and a personal reference for the receiver, a reference to the related document and a response code. It also has to meet the demands in this document guideline. EndPointID is used to identify the "electronic mailbox" where the electronic document is to be delivered and also provides the basis for routing the message. PersonReference is used to identify the person responsible for procesing the received electronic document. Documentreference is used to identify the document related to ApplicationResponse. ResponseCode is used for indicating the kind of receipt issued. Please read more about the use of ApplicationResponse in [G35]. The version of the UBL schema being used. The identifier for a user defined subset of UBL. The identifier for a user defined profile of the subset of UBL being used. 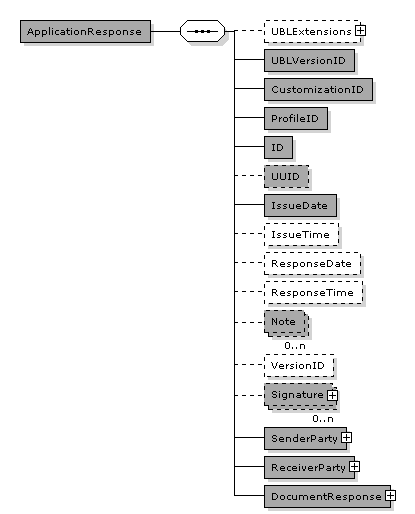 A computer-generated universally unique identifier (UUID) for the Application Response instance. Free form text applying to the Application Response. This element may contain notes or any other similar information that is not contained explicitly in another structure. UBLExtensions are used to make extensions to the OIOUBL document. The extensions can be agreed by 2 or more parties and must be registered by IT- og Telestyrelsen. If the class is used it must contain a minimum of one UBLExtension. The content of UBLExtension will be ignored by validators supporting W3C XMLSchema. An association to the Party sending this document. An association to the Party receiving this document.